Back to School with Bari Koral! Moon Dough Play Sets Are Out of This World! How Much Allowance Should Your Child Get? The Paper Mate Plant-a-Pen Challenge! Another Great Opportunity to Win Googly Bands! How to Cover Up That Funky Futon for College! Catch the Balloonatiks on DVD! Don’t Go Back to School Without Pentel Products! When I was a little girl, my sister had a record (a “45” … we didn’t have CDs back then!) that she received for her birthday one year. It was a personalized birthday song that told about the adventures of a character named Captain Zoom who lives on the moon! My sister and I played that record over and over again until we had the song memorized. We absolutely loved it, especially since it mentioned her name eight times! It was as if the song had been written especially for her. All systems are go for your message to Jason! Hey, Jason! It’s your birthday! Hey, Jason! You’re the big star today! ’cause Jason, it’s your birthday today! Singing, Jason! Happy Birthday, to you! Happy Birthday, Jason! See you next year! And Captain Zoom now has an Anniversary, Wedding, and Christmas song, too! 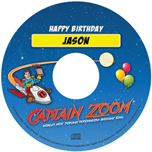 The Captain Zoom personalized birthday song is a fun, one-of-a-kind gift for any children in your life. Watch their eyes light up as soon as they hear their name in the song! I’m betting they’ll love it just as much as my sister and I did. Go to www.captainzoom.com to listen to a sample, check out their specials, and place an order! DISCLOSURE: I’ll be receiving a complimentary Captain Zoom recording for my twins as a thank-you for sharing this information. No other compensation was provided. My brother got the record and we did exactly the same thing. Knew every word. We also had fun playing it at 33 1/3 RPM.